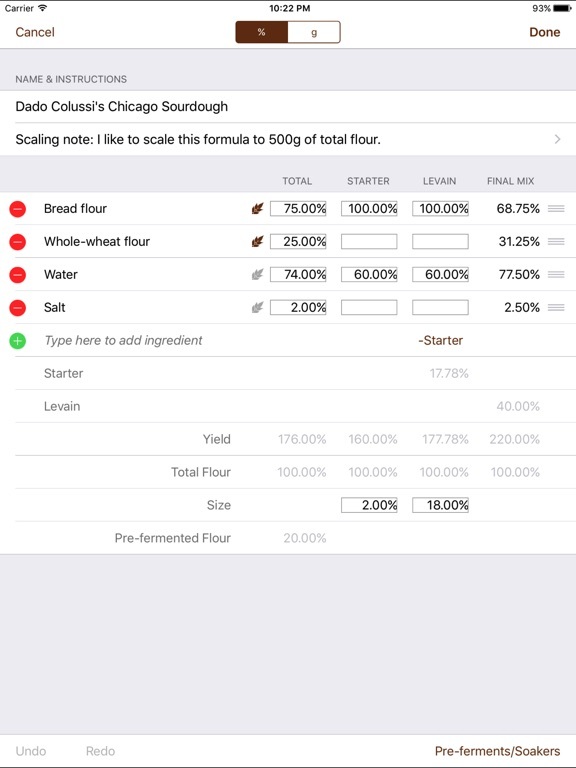 With BreadStorm™, create bread formulas in baker's percentages or metric weights, elegantly and swiftly, without doing any math. BreadStorm handles all calculations, freeing your time for the fun and rewarding process of developing new breads. (No more time wasted fiddling with spreadsheets.) BreadStorm is the gold standard for bread bakers, professional and amateur alike. Now for iPad! WHAT CAN I DO WITH BREADSTORM? 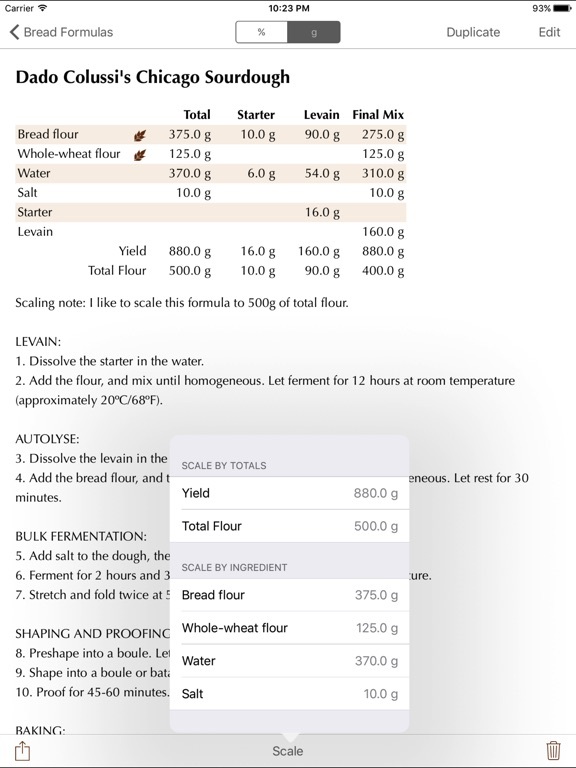 - Create/edit bread formulas in baker's %, grams (g), or kilograms (kg) in seconds. BreadStorm does all calculations for you automatically. - Scale by any ingredient. - Add pre-ferments and soakers to a formula. - Build one pre-ferment into another (useful when working with multi-stage levains). - Duplicate a formula (handy for iterative formula development). - Import formulas created by fellow BreadStormers™. - Share your formulas with fellow BreadStormers via email, Messages, and AirDrop for iOS. - Full-text search your formula database. - Via WiFi, sync your BreadStorm formulas across your devices. WHO USES BREADSTORM, AND HOW? - Head bakers and bakery owners, to formulate new product ideas in seconds. - Micro-bakers, to develop new formulas and organize small-scale production. - Teachers and students of bread baking, to exchange formulas and learn interactively together. - Bread bloggers, to share formulas with their readers. - Avid hobby bread bakers, to organize and support their home bread baking and to exchange formulas with bread-baking friends. 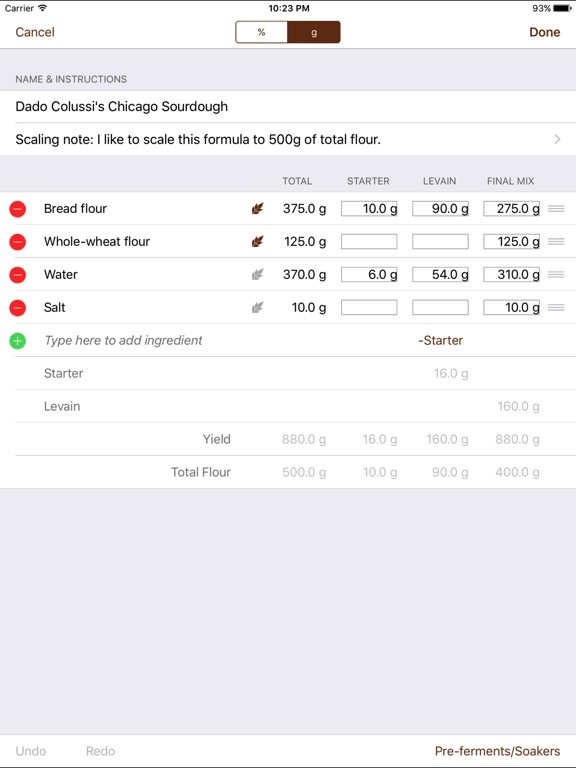 "BreadStorm is a fast and effective tool that I use for recipe writing on the go, the simple... printed layout is easy for my bakers to read. I find it very easy to use—pretty much no training required." —Andy Clark, Chief Operating Officer, Udi's Artisan Bakery, USA, and board member, Bread Bakers Guild of America. "I'd like to say how much I'm loving BreadStorm and how useful I'm finding it…. It's great for product development, so simple to use." —Nick Boggon, co-owner, micro-bakery Hitchin Bakehouse, UK. WHO CREATED BREADSTORM? 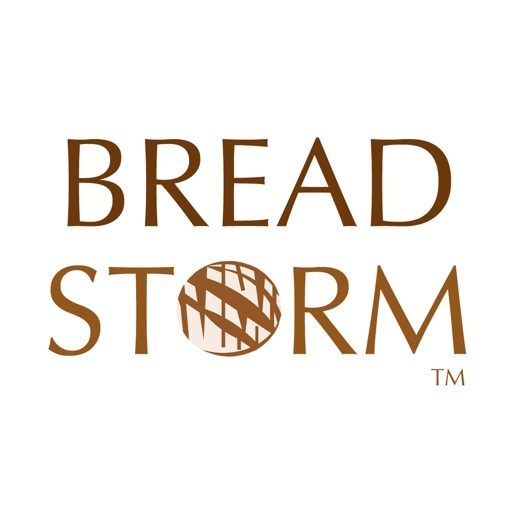 BreadStorm is the brainchild of Dado and Jacqueline Colussi, avid bread bakers; entrepreneurs; organizers of the "Chicago Amateur Bread Bakers" meetup in Chicago, USA; and founders of the monthly #BreadChat™ around the world on Twitter. We take great satisfaction in developing a tool that we, ourselves, use every day. - Printing requires an AirPrint-compatible printer. Q: Does BreadStorm support decimal pounds? Pounds and ounces? A : No, currently BreadStorm supports only g and kg. Q: Will I get my money's worth from the app? A: Yes, if you regularly develop new formulas and/or tweak existing ones; make frequent use of advanced baking methods such as pre-ferments, soakers, and builds; or manage a large number of formulas. Q: I don't know yet how to use baker's %, but I do weigh my bread-baking ingredients in g (or kg). Can I use BreadStorm? A: Yes. 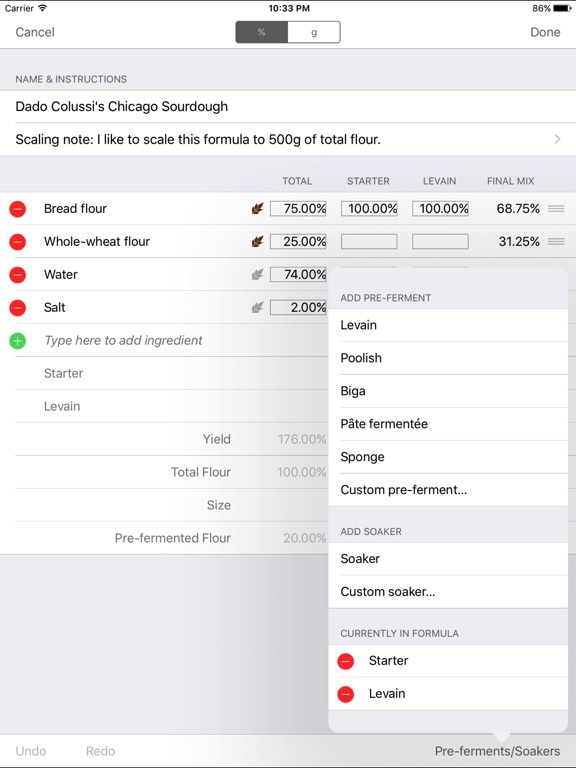 To use BreadStorm, enter bread formulas into the app using weights. BreadStorm will calculate baker's percentages for you. Many BreadStormers find this a fun and low-pressure way to learn baker's % on their own. SUPPORT: Dado and Jacqueline welcome your feedback and questions. Please email us at support@breadstorm.com or tweet to @BreadStormBaker. Thank you for your purchase! May your loaves rise well.